Hello Leo Listeners. 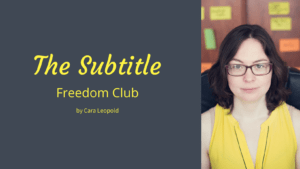 It’s Cara here from Leo Listening, where I help advanced English learners fall back in love with their favourite films and TV series by getting rid of the subtitles. 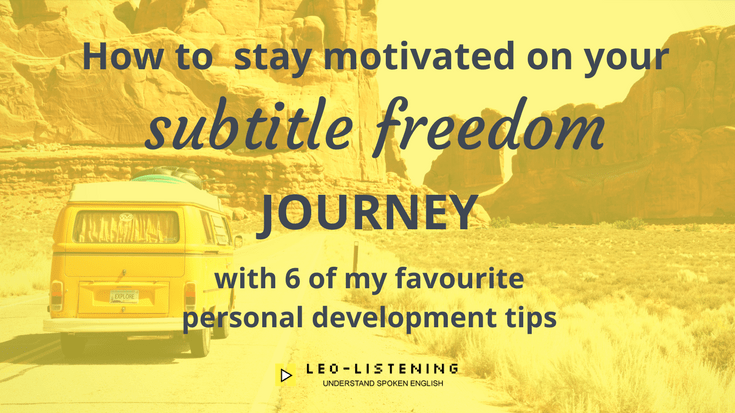 Today we’re applying some of my favourite lessons from various personal development authors and thinkers to listening, and to subtitle freedom. Sometimes it’s really hard to stay motivated and to keep believing in yourself when understanding English feels so hard and you feel like you’re never ever going to get there. So, the first rule or concept – it is a rule actually that I share, is the 80 20 rule. For me, this is really the rule to end all rules. So if you only take one idea from everything that I talk about, or anything any other personal development person talks about, then you should take this rule. The 80 20 rule, is also known as the Pareto Principle, after the Italian economist who discovered it, or the power law as it’s sometimes called. This rule is perfect for perfectionists, so that’s me, and probably you if you’re watching this. The idea is that 20% of your effort and input leads to 80% of your results. Another way to look at that is that 80% is good enough. If you’re the sort of person who always aims for 100%, and anything less doesn’t feel good enough, no! Start aiming for 80%. Another way to look at it is if you need to put in 20% effort to get 80% results, then to get that last 20% and reach 100%, you need to put in 80% of your effort, which is way too much and way too exhausting. This is why I tell my students and anyone who’ll listen that for subtitle freedom, what you should be aiming for is to understand 80% of what you hear. So once you get to 80%, you can comfortably switch off the subtitles and you’ll understand enough so that you don’t need to worry about the last 20%! Freedom! Sweet relief – because we don’t need 100%. 80% is the level to aim for, so thank you to the 8020 rule for teaching us all that. Another personal development principle if you like is more of a business one from Denise Duffield Thomas, who is one of my business mentors or money mentors. 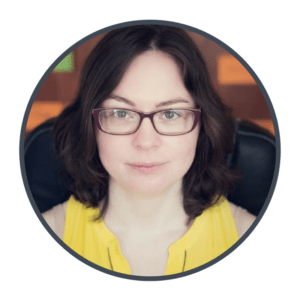 I love her work and she says that the easiest way to make money in your business without stress or burn-out is to do something that’s easy for you, but that other people need help with. So it has to be easy for you. By the same logic, the easiest way to get subtitle –free fast is to watch or listen to what you enjoy. That’s why on Freedom from Subtitles, I always ask people which series they most want to understand, and we just focus on that. That’s how people get results so quickly. You don’t need to understand the latest series or the trendiest series. 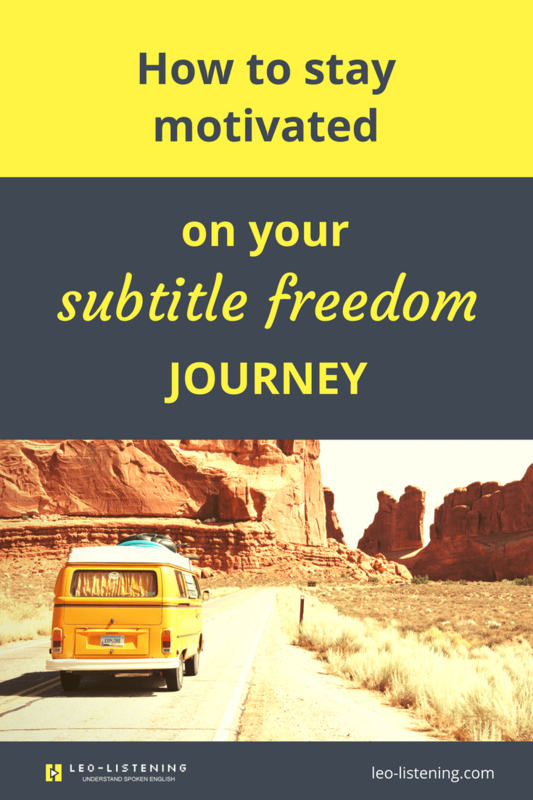 You just need to pick the one you really want to understand and focus on subtitle freedom for that series. Then, when you’ve got that and can understand 80% of it, you can move on to the next one. That’s fine. But don’t try to learn 10 at once or something like that. The next principle comes from this huge book called “Flourishing“. To sum it up quickly, it’s about the fact that 50% of your happiness is genetically inherited, so you have a tendency to be more or less happy according to your genes. 10% is to do with your circumstances, so how much money you make, your job, where you live, that kind of thing. The remaining 40% of happiness is completely under your control. One of the ways to control that 40% of your happiness is to stop comparing yourself. Comparing yourself to other people is just going to make you unhappy. I know we all do it. I know I do it. I’m trying to stop doing it. It really is going to make you so miserable. What’s much healthier is to compare yourself with yourself, and to measure how you’re progressing as a person in all kinds of little ways. That applies to listening in the sense that you can write down the progress that you’re making every week. Maybe you’re listening to more English. Maybe you understood more of a series this week compared to last week. Maybe you’re just being kinder to yourself and not saying nasty things to yourself when you don’t understand something. That’s progress as well. Maybe you’re being more patient with yourself when you don’t understand something. That’s the big piece of advice here. Stay in your own lane, as we say. Don’t look around at what other people are doing. Try to track your own progress. I’ve got a free resource where you can do that called the Leo Listening Log. I’ve also got a partner product called “the language habit tool kit” by my friend Kerstin, which is a more comprehensive system for making goals and tracking and building your language habit. I’ll link to both of those. NB the language habit toolkit link is my affiliate link so i’ll receive a small commission if you decide to buy through it. Click is totally free. Thanks for supporting my blog and work. The next personal development principle is goal-setting. I’d say again that comes from Denise’s work because she talks a lot about goal setting. She says it’s hard to set goals because it’s hard to admit what you want. It’s hard to make a plan to get there. Goals are scary because we’re all frightened that they might not come true. What happens if they don’t come true? On the other side, there’s what happens if they do come true. Sometimes the consequences of achieving your goals can be scary. One of the big pieces of advice we hear everywhere about goal setting is to make your goals specific – this is the tricky part, but this is really important. You can’t have a goal like to understand every series in English in the world without subtitles. That’s not achievable. How do you measure that? That’s just not realistic. Your goals should be more like watch an episode of Gilmore Girls without panicking when I don’t understand a word. That’s it. Just small steps. Think of small and specific things you can do to get to your goals. Again, something like the language habit toolkit is a good resource for making realistic goals for your language. The next point again is something that comes from Denise, who is someone who has read a lot of personal development stuff and done a lot of work on herself, and she knows about these things. The next point is feel good about what you’re listening to and watching now. This comes from the idea of manifesting what you want. Some people don’t really believe in that. I’m maybe a bit sceptical about it too. But one of the principles of that is that to get what you want, you need to imagine how it would feel, and then focus on feeling the way you want to feel. Whether or not you believe that actually works, it’s obviously much more pleasant to feel the way you want to feel than to feel bad about yourself. Focus on the feeling that you’ll have when you don’t need the subtitles any more. For me it’s the feeling of freedom. So focus on that feeling and start taking the steps you need to get there. Start switching the subtitles off a bit and experimenting with it. See how it feels, and try to feel good about it, even if you don’t understand everything without the subtitles. The final tip, and I think this is probably the core of a lot of personal development stuff is to have compassion for yourself. We all need to be reminded that we are good enough now. We’re good enough as we are. We’re worthy now and we don’t have to be perfect. Even if you feel your English isn’t good enough, you don’t need to feel bad about it or feel guilty about it. You are good enough now. 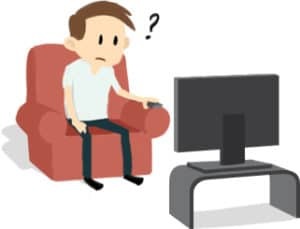 You can watch series without subtitles and you will get there. So stop being nasty to yourself and start being kind and compassionate to yourself and I think you’ll get there a whole lot quicker. Thanks again for reading and I’ll be back again very soon! Fed up of not understanding films in English? 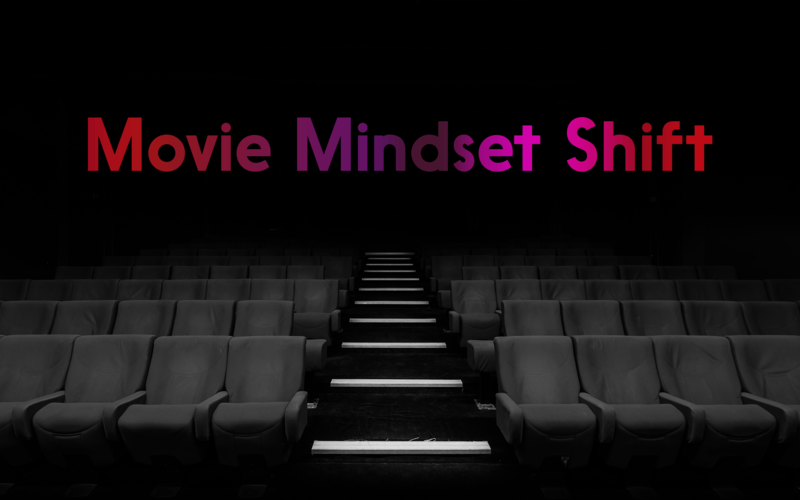 Movie Mindset Shift is a 30-day listening challenge that’ll show you how to work with movie clips, not whole films, to gradually build up your listening skills.You watch and understand 10 clips from 3 of the best films of the last 20 years. You go beyond just listening – you do exercises that work because they teach you why you don’t understand. Click here to find out more and take on the challenge.